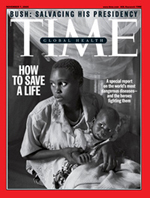 In Time Magazine's special issue on global health, James Nacthwey documented the global health crisis due to infectious diseases. The CHC was honored for its unique synthesis of pioneering novel approaches to delivery of TB and AIDS care in one of the poorest places on the planet and its work in integrating basic scientific discovery to work towards new drugs and vaccines. A 2004 article from the CBR Institute for Biomedical Research newsletter about TB and HIV in Cambodia and the work of Dr. Anne Goldfeld. A 2004 article from the American Foundation for AIDS Research (amfAR) newsletter about the CHC's AIDS treatment program. A 2003 Boston Globe article on health and medical care in Cambodia. Photojournalist James Nachtwey documented the twin epidemics of HIV and TB in Cambodia and the work of the CHC in this award-winning portfolio.